NOTHING STAYS SECRET IN MAGIC. 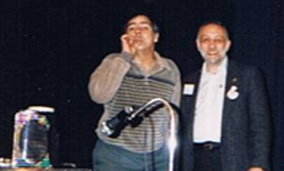 Long before smoking was banned from public places, we banned it from Magie Montréal, the annual magic convention that Phil Matlin and Wim Vermeys produced for 19 years. The convention goers accepted it graciously for the most part. That dealers’ room was usually packed and got so smoky that it was a reasonable request. The dealers were another story. One dealer wouldn’t come back because we wouldn’t let him smoke his cigar. 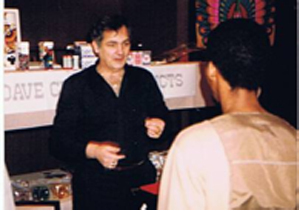 was in the main show that year, got so upset when he heard he couldn’t smoke, that he packed his bags, cleared out his booth and left the dealers’ room. Hank Lee, one of the other dealers at the convention, realizing that there was now a big empty space in our gala show graciously offered to put together a show at the last minute to fill in. He said once Dave made up his mind to something, that was it. My Dave, my friend, was walking out on me? I couldn’t believe it. Where is he? I demanded to know. Out in the hall calling a cab! He gave me a funny look and to everyone’s surprise went back into the dealer’s room and set up his table again. He didn’t talk to me much that convention, but when he came out on stage for the dealers’ show, he had cigarettes in his ears, up his nostrils and in his mouth. “This is for Evy,” he said. Of course everyone knew what had gone on; nothing stays secret in magic, but he got the last laugh. 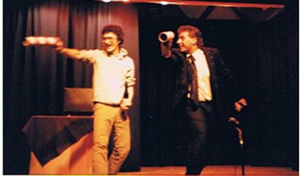 Speaking of memories, Rick Bronson’, owner of The Comic Strip, and The House Of Comedy entered the Stage Magic Competition at a Magic Montréal Convention in 1991. My son Michael was sitting in the audience and Rick managed to get him on stage as a volunteer, although he must have used some strong armed method, as I can’t see Michael going up there voluntarily! My youngest daughter Julie, who was about 18 the time was sitting beside me watching the show, and she leaned over to me and said, “Michael is such an idiot to go up there. Wild horses couldn’t drag me on stage.” As I recall Ricky did a great version of the classic Tricky Bottles and Michael was really a good sport about it and seemed to be enjoying himself up there, in spite of the fact that Ricky made him look a little silly. The next day, when the Gala Show came on, I think I was sitting with Phil, although he was usually back stage controlling traffic, when the Zucchini Brothers came on. 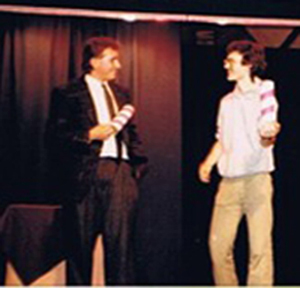 We usually had one act that wasn’t magic but was sort of tied in to the genre, like a ventriloquist, or a mind reading act, and in this case a juggling act that was hilarious. He took out a scissors and cut the straw. Every few minutes he stopped to cut it shorter. Everyone laughed except Julie. “Well,” she said, “when he came to get me, I told him I wasn’t going and he said, ”Yes you are. It will be fine. I okayed it with your Dad.” She didn’t want to spoil the show so she went. By the way, Ricky has since gone on to be a stand up comedian, is a comedy club owner, had his own TV show. I think it was called The Traveler. (Check out his web site). DRAGGED SCREAMING AND KICKING INTO THE 21ST CENTURY! It doesn’t seem like 34 years, but that’s when PERFECT MAGIC opened its doors. Now we have 6 computers; three at home and three in the office. Phil’s okay with them. He convinced me that an iMac would make his work so much easier. I’m still learning how to use the telephones. They were much simpler then too. For you youngsters who were born with a mouse in your hand, you will have to picture a world without computers, without DVD’s, without Video tapes, Facebook, or Twitter, and all those other gadgets you have attached to your ears. Back then an apple was something you ate, and if you had a mouse you’d get an exterminator. If you wanted to know what was new in magic, you went to the magic shop or magic conventions, or bought MAGIC MAGAZINE , or the GENII or sent for catalogs, which were made out of paper – period. If you wanted more than a magic trick you bought books and read. 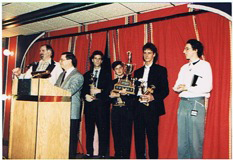 If you were really serious you might even join the local branch of an international magic organization, the International Brotherhood of Magicians (IBM) or the Society of American Magicians (SAM) The Canadian Association of Magicians (CAM) and their magazine Northern Peaks wasn’t born yet. Membership to either one entitled you to their monthly magazine which also provided magic tricks, news, etc. 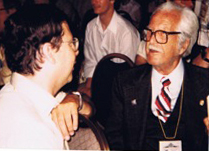 From time to time famous magicians would come to town and give lectures. I remember Dai Vernon lecturing at the Mount Royal Hotel when it was on Peel St.
People would come into the store and ask what’s new? We’d demo a trick and if they liked it, fine, if not… on to something else. We knew each customer, what they liked, what they were capable of, and would guide them accordingly. Those days are over! Now if a customer sees something on YouTube and if it’s not on our website, they email us or phone and ask if we can get it for them. Usually we can. There’s a whole world to choose from. A few weeks ago a customer wanted the book “Handcrafted Card Magic” by Denis Behr. After many phone calls it seemed that the only way to get it was from Denis himself, who lives in Germany. So we did. So instead of us going out and deciding what is great, we let you, the customer, do it. We let you know what’s there, but in end, you’re the boss!. 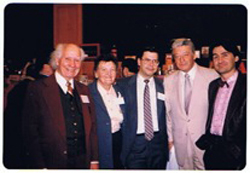 Sid Lorraine, his wife Rene, Phil, “Magic Tom” Auburn and Carl Cloutier. What we did have was Magic Conventions! 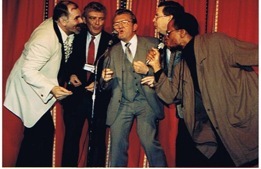 19 years Wim Vermeys and Phil Matlin and wives worked year round to make sure you had the best entertainers of the day. David Acer, in About Perfect Magic (see first paragraph above) talks about the first Magie Montréal we held on the Site of Expo 67. Were you there? I’ve posted some photos of the early days which may bring back some memories. Enjoy! Can you name all the people? If you have special memories of those days we’d love to hear about it. If you want more photos let me know. And the winners are ……..